Front Line: Seamus Mangan, Colleen Mangan [Wallenhorst], Mary Kilbane [McHugh], Eileen Mangan [Stull], Michael Mangan, Peggy Mangan [DeMarco]. Back Line: ?,?,?,?, Terri Wallace, [then] Governor John Gilligan, Therese Ann Rooney [McGlynn], John McKenna, ?, ?. 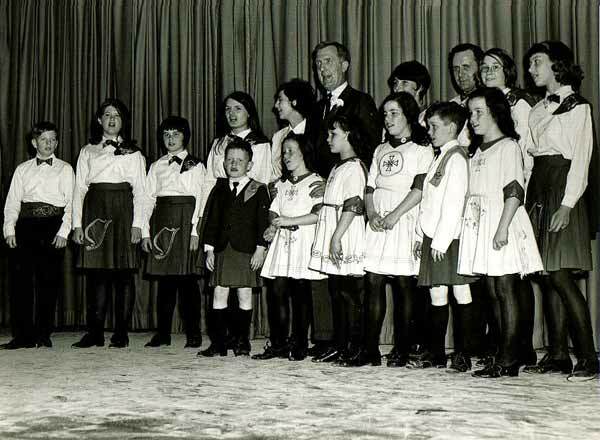 The photograph was taken at the Hibernian Banquet on St. Patrick's Day at the Hollenden House Hotel in 1967. The dancers were from the Burke and McKenna schools.